Last night I took my friend Phil (above) to his second ever hockey game at the Xcel Energy Center to watch the worst team in the west play the second worst team. Now one of them is only the third worst team, and unfortunately it isn’t the Wild. Burns at -13, Koivu at -12 and Havlat at -10? How is that even possible? The three goals in 1:47 was amazing, but only one shot in the remaining 17:42 of that period? And I agree with Russo – how do you scratch Sykora and play both Scott and Boogaard? On defense, I wanted Skoula gone as much as anyone, but Zidlicky and Hnidy seem to be battling for the new crown of Wild defensive goat. Zids and his turnovers make me cringe and Sheriff Shane can’t seem to hit an outlet pass to save his life – it’s either a turnover or icing almost every time. As Mr. Fletcher said during an interview in Chicago, “we’re still trying to get on the same page.” I was hoping that would have happened during training camp and the pre-season, but here we are 12 games into the season and the Wild sit in the western conference cellar with none of our “stars” hurt. Maybe that’s it – Johnnson and Butch are the secret sauce we need to turn it around. 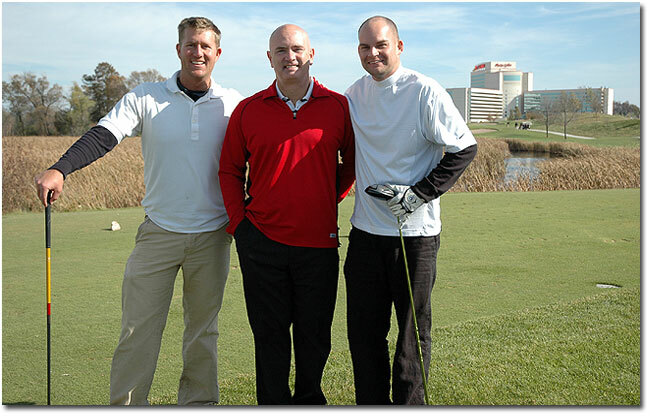 Thanks to a last minute call from my lawyer and friend KJ, I got in nine more holes for the 2009 golf season. 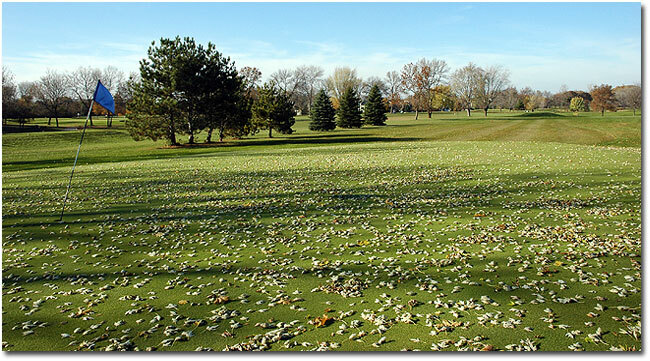 We played the back nine at Parkview Golf Club in Eagan, which as you can see above, was absolutely covered in leaves. There actually is a ball in the picture, if you can believe that. Good thing scores don’t count after October 15 in Minnesota (although I did birdie the par five thirteenth hole). Barring another warm-up, that’s probably it for me this season. Time to get the skis ready! 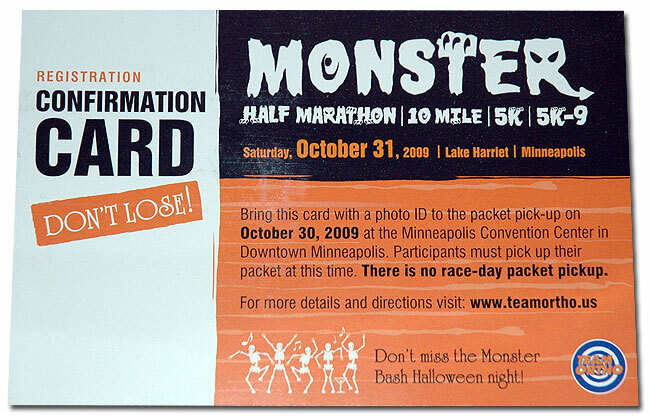 The confirmation cards arrived in the mail today for the 2009 Monster Dash events in Minneapolis. This year the races will actually be on Halloween morning – the half marathon I’m running starts at 8:30AM, followed by the 5K that Colleen and the kids are doing at 10:30AM. The plan is for me to finish in under two hours and join them for the 5K. It’s been almost two weeks since we picked up the new iPhones at the Mall of America, so I thought I’d write up a short review. AT&T also sent me a survey last week, so it got me thinking about what I like and don’t like about the 3GS (after switching from a first generation model). As I wrote when I got the original phone, I’m not a big fan of the touch screen keyboard. After several years, I’m still not sure I like it all that much. I’ve gotten better at typing on it, but it still seems awkward to me. Even with the auto-correction, I still find myself correcting errors way, way more than I do on my laptop keyboard. The new cut-and-paste tools don’t work very well for me, either. It nice to have the option, though. The 3G service from AT&T has been OK in my area – faster than Edge with decent coverage. I still experience the same dead zones as before and have had a few dropped calls. I don’t care about the MMS issue (don’t use it), but the tethering thing bugs the hell out of me. I’d use that if I could (and it should be included at no extra cost). As for the phone experience, it feels better in my hand (lighter and sleeker), apps run much faster and the new camera options work great. It’s amazing to me that I can shoot video, edit it on the phone and upload it directly to Facebook from just about anywhere. I had some issues moving my settings and files over from the old phone, but nothing major. Having the extra storage space is wonderful – I now need to figure out what songs and movies I want with me all the time. I still have 15GB open on the device, after loading 1799 songs, 11 videos, 591 photos and 20 applications. I’ve also been looking for a good TV listings app (currently using i.TV, but I’m not sold on it). I love that you when you buy an app, you can put it on all your devices without having to pay again. Colleen bought a case for her new iPhone, but I’ve left mine plain so far. I’m really partial to Skinizi products (especially this one), but they are expensive. I also picked up a pair of the Apple in-ear headphones, which are awesome (and well worth the price). So overall, I’m very happy with our purchase. It’s not perfect, but it does just about everything I want. Yesterday might have been my last Minnesota round of the season, and what better place to play than the Meadows at Mystic Lake with my friend and neighbor Tim (center). We both had our doubts about the weather at the start, with clouds covering the sun and winds blowing 13-17 mph right in our faces on the longer holes on the course (including the way too long 442-yard, par four fifteenth hole). Tim’s brother-in-law Bob (right) and his friend Dave (left) also joined us. Things turned out fine, though, and I shot my usual 93 from the 6,668-yard blue tees (72.3/142). The highlight of the round for me was a birdie on the 410-yard, par four fifth hole. My drive was in the fairway, but left me with about 190 yards to the green, which is fronted by water. I hit one of my best four-iron shots ever, landing in the front third of the green. The 15 foot birdie putt curved right into the middle of the hole. I wish winter would hold off a little longer – all of the courses I’ve played lately have great conditions now that could last another few weeks. Hard to play in 40 degree temps and snow showers, though. Tim and I stayed for lunch in the wonderful Meadows Grille and watched the last ten minutes of the Vikings game (which was another story in itself). Thanks again, Tim! Thanks to member Steve Morrison, the Miller boys and I played Bristol Ridge Golf Course in Somerset, Wisconsin, this weekend. I had never been to this course before and was happy to get out anywhere after a few weeks of cold and snow. Located about 15 miles from Stillwater, Bristol Ridge was different from what I expected. Some holes reminded me of Hidden Greens (like the narrow, wooded, 354-yard second hole), while others had similarities to Braemar – long par fours with lots of elevation change. The fall colors really made the course pop, too. The weather was perfect and the crowds definitely picked up behind us as the morning went on. I couldn’t hit a straight drive to save my life on the front nine, which contributed to a not-so-great 48. I had four pars on the back nine, but still only managed a 45, thanks to one blow-up hole. I really need to make driver improvement a priority next season. After the round, we had a nice lunch that included cheese curds and grilled cheese sandwiches – when in Rome, right? With the marathon last week and the snow this week, I sort of forgot to post about golf round 28. 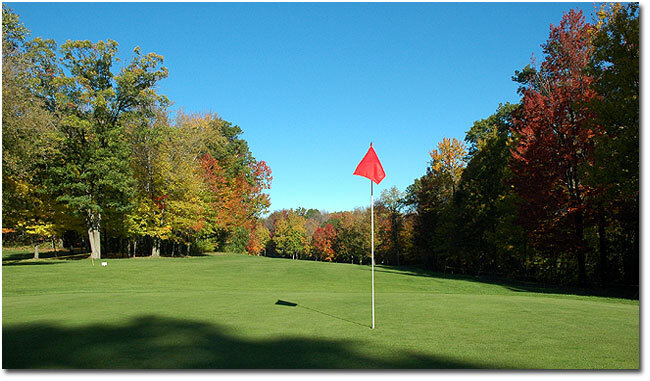 On October 1, I played a free round with my neighbor at Crystal Lake Golf Club in Lakeville. We both had coupons for a free mid-week round that we had received at the Guide Dogs tournament this summer. It was rainy, cold and windy, but a free round is a free round, right? We actually only got rained on for two holes and pretty much had the entire course to ourselves. I didn’t play that great, shooting 92 from the 5,827 yard white tees (68.7/127). I also had a $25 gift card from last year’s tournament that we used for lunch afterwards. Just in time for the first (and second!) Minnesota snow storms in October, I purchased new tires for the MINI. The car now has almost 75,000 miles on it and the tires on the front were actually still the originals. I bought two new ones a few years ago and rotated the old rear tires to the front. This time, I picked four new Bridgestone Potenza G019 Grids (size 195/55R-16). 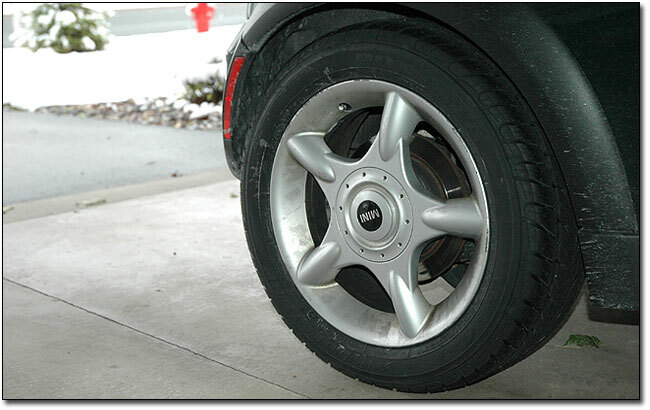 Discount Tire in Apple Valley installed them for me quickly and smoothly for around $500. Saturday also turned out to be new phone day. Colleen decided she was done paying T-mobile $50 a month for her pink Razr and wanted to upgrade. We went to the Mall of America and visited both the Apple Store and the AT&T corporate store, the latter of which was able to convert my account to a family plan. 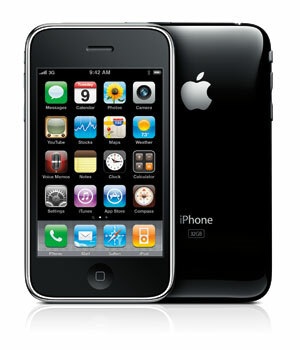 Colleen switched to a white 16GB iPhone 3GS, while I upgraded from a first generation iPhone to a black 32GB iPhone 3GS. So now kid one has an iPod Touch, kid two gets my old iPhone (sans phone service) and we both have current iPhones. Everybody’s happy! 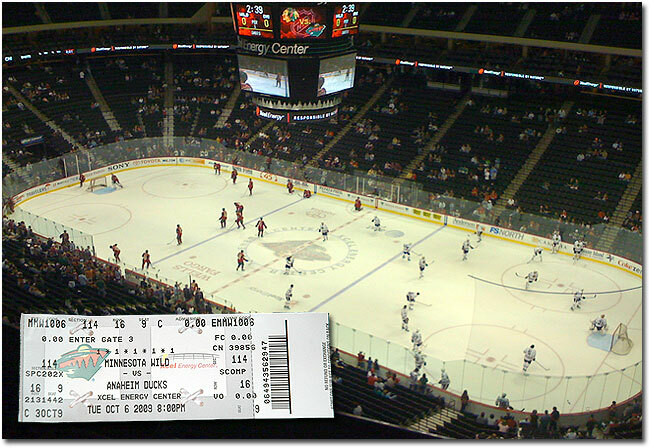 Thanks to the Wild’s youth hockey donation offer, I picked up a free ticket to tonight’s home opener versus the Ducks. 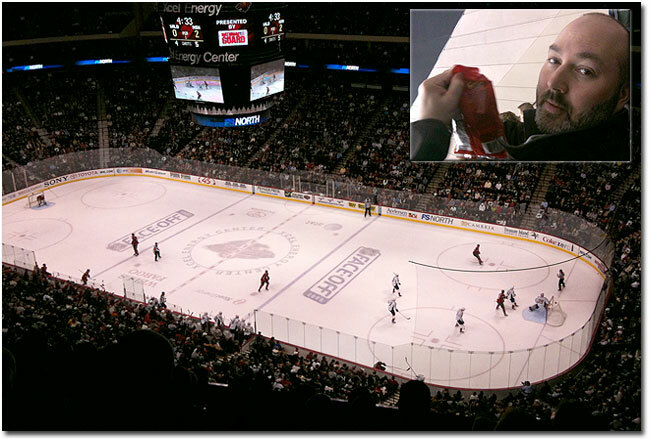 I’ll be in section 114, row 16 – should be a nice spot to watch the Koivu brothers mix it up. Late start (8:15PM), but the Twins game will be on in the X starting at 4PM. I haven’t written much about the preseason here, as there are now so many good sources of local hockey news. I rolled up all of my Minnesota sports into this one (including Hockey in Minnesota), so I haven’t had a pressing need to write just for the sake of having something new up. I will post when I go to games and hopefully have something unique to add to the Wild blogosphere. I’ll probably keep the @hockeymn Twitter account going this season too for some occasional in-game commentary. There are a bunch of others, too, but I’m finding it’s becoming increasing easy to get overwhelmed with information (and a lot of repetition via re-tweets). Hell, between the team’s own PR group (which gets better and better all the time) and the superb work of Mr. Russo, you pretty much get all you need to know. Well, that turned out to be fun. Everyone in the arena was focused on the Twins for the first period, so I didn’t really notice how we got to a 0-0 tie at intermission. The second period was just horrible. I knew as soon as John Scott and George Parros lined up in the third period a fight was going down. People around me didn’t know why I starting clapping right away, but the coach said during the post-game interview that was the turning point of the game. I’d also like to thank Mr. Wisniewski for letting us have the extra point without having to go to the shoot-out. Not much new to report from the arena experience tonight. Everyone got a team wall calendar, the sell-out streak is apparently over, they played the Twins rouser over the PA and the starting lineup sequence and national anthem were a little different (but that might just be due to it being opening night). Craig Leopold sat by himself in his suite for most of the game. I ordered some teriyaki chicken wings, but they are now Brakebush, not BWW (I think this actually changed last year). I think there may be a few new food items available this year, too. 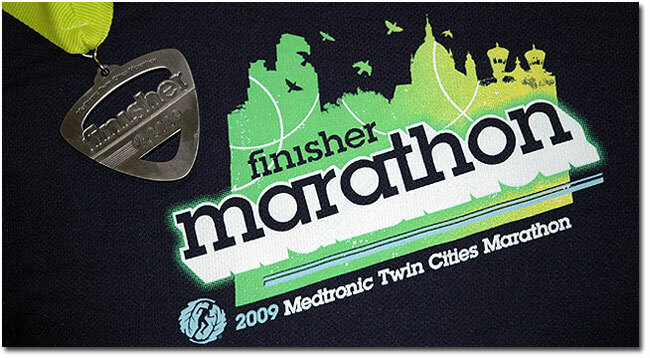 Here’s what the 2009 editions of the Twin Cities Marathon finisher’s shirt and medal look like. I’ve added the medal to the background image here on the 7 Minute Miles home page (and also on my Twitter page). 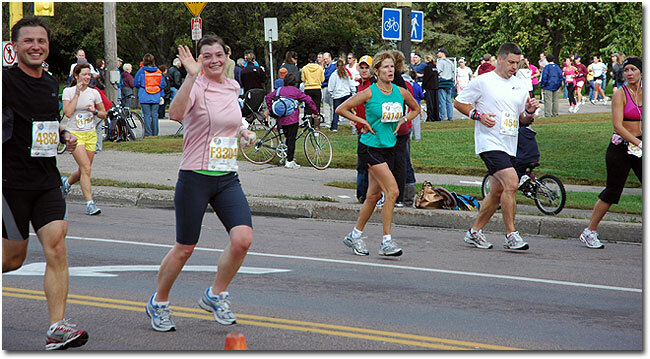 Today was the big day – the 28th running of the Medtronic Twin Cities Marathon in Minneapolis and Saint Paul. This was my sixth TCM (fourteenth total) and today I was running with my friend and neighbor Gina in her first ever marathon. The weather was perfect (low 40s at the start, overcast skies and light wind) and the race went really well. Gina’s goal was 4:30 and we were on that pace until the last few miles, finishing in 4:36:19 (10:33 pace). I’m very proud of her – she went from her first 8K race last summer to a half marathon this spring to a full marathon today. Impressive! There were 8,428 finishers today (3,539 women and 4,889 men), with an average time of 4:20:39. Jason Hartmann of Grand Rapids, Michigan, won the men’s title in 2:12:09 (5:03 pace), while Ilsa Paulson of New York won the women’s title in 2:31:49 (5:48 pace). Today we got everyone out of the house for the Twin Cities Marathon Family Day events at the state capitol grounds. The weather wasn’t great (cold and rainy), but more than 5,000 other brave souls turned out for the 10K (new this year), 5K, Diana Pierce Family Mile, Half Mile, Toddler Trot and Diaper Dash. Colleen walked the 5K with a group from Allina and finished in 59:02 (19:00 pace). The 5K was won by Mathew Chesang in 15:30 (5:00), while Meghan Armstrong took the women’s 5K title with a time of 16:45 (5:24). There were 1,989 finishers (850 men and 1,139 women), with an average time of 35:04. The inaugural 10K was won by Evgeny Beletskiy in 33:49 (5:27). Ariella Gottfried was the first women to cross the finish line with a time of 36:32 (5:53). There were 1,215 finishers (458 men and 757 women) and the average time was 59:50. Our kids both decided to run in the one mile race this year and we all had the opportunity to meet Diana Pierce before the race. Deerwood had a smaller crowd this year, but it was great to see everyone. I stopped in at the expo two more times today – once to get an event poster signed by the artist and later in the day with my neighbor Gina (who will be running her first marathon with me tomorrow). It’s amazing how much free junk you get at those things – even more when you bring kids along. Pictures from today have been uploaded to Facebook and the private section of the 7MM photo gallery – email me if you need access to either. Tonight I stopped in at the TCM Expo in downtown St. Paul to pick up Colleen’s 5K bag and my marathon stuff. The family races are Saturday (the 5K is at 9AM and both kids are running the one mile race at 10AM), while the marathon starts Sunday at 8AM. I was so sad to see the “M 40-44” tag in my packet – I guess that makes me a masters runner now. Sigh.